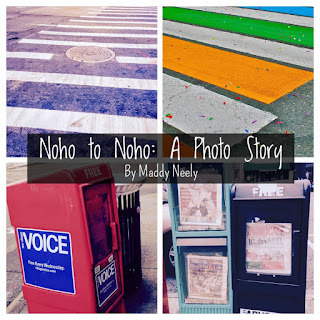 NoHo to Noho, a photo story, details similarities and differences of Maddy growing up in the neighborhood of NoHo in Greenwich Village of New York City; and her current life in Northampton MA, also called NoHo. Come along with Maddy as she compares and contrasts the two Noho’s, with their ordinary and extraordinary sights such as quaint cafes, local bookstores, city crosswalks and bicycles racks. No matter where you live, you will enjoy this stimulating pictorial adventure. This exhibit features a total of 20 photos; 10 photo comparisons.